It was launched in 2004, and it is open source Test Tool suite. Q) What are the components or modules of Selenium? Q) What is Selenium IDE? 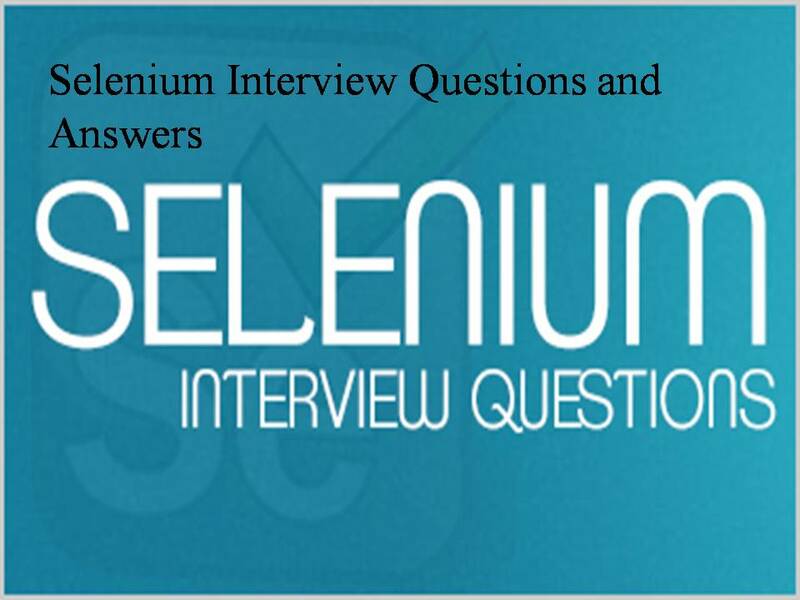 Q) What is Selenium RC? Q) What is Selenium WebDriver? Q) What is Selenium Grid? Selenium-Grid allows the Selenium RC solution to scale for large test suites and for test suites that must be run in multiple environments. Selenium Grid allows you to run your tests in parallel, that is, different tests can be run at the same time on different remote machines. Q) Can Selenium test an application on iPhone’s Mobile Safari browser? Q) Can Selenium test an application on Android browser? Q) What tests can selenium do? Selenium could do functional, regression, and load of web based applications. Q) What are the disadvantages of Selenium? Q) What are the technical challenges with selenium? Q) How to run test case recorded using Selenium IDE in other browsers? Running test case recorded with the help of Selenium -Remote Control or WebDriver. Q) What is the selenium’s recording language? Q) What are the steps to run automation using selenium? Q) What are the capabilities of Selenium IDE? Q) What are the challenges with Selenium IDE? Q) How to execute a single line command from Selenium IDE? 1. Right click on the command in Selenium IDE and select “Execute This Command”. 2. Select the command in Selenium IDE and press “X” key on the keyboard. Q) What is Selenium Remote Control? Selenium-RC is the solution for tests that need more than simple browser actions and linear execution. We can use Selenium-RC whenever our test requires logic which is not supported by Selenium-IDE. Selenium-RC uses the full power of programming languages to create more complex tests like reading and writing files, querying a database, and emailing test results. Q) What are the advantages of Selenium? • It is a Open source. • Simple, Easy to install, Easy to work. • Selenium IDE is the only flavor of Selenium which allows you to record user action on browser window. • Can also record user actions in most of the popular languages like Java, C#, Perl, Ruby. • It will not record any operation that you do on your computer apart from the events on Firefox browser window. • During recording if you right click on any element it will show all the selenium commands available. • we can also edit existing command, by selecting it and editing on the boxes available. • we can also insert/delete commands by choosing appropriate option after right clicking. • Choose appropriate run option – i.e walk, run or test runner and review your results. Q) How to Use Selenium? We can use the selenium by selecting “Selenium IDE” from the Tools menu in Firefox. By default when the IDE comes up it has recording turned on. Go to a web site that you want to record, click on the record button and begin the browsing task(s). we will notice that as we click and type in the browser the IDE is recording everything we are doing. When we are done, simply end recording and click on the green arrow to play back the script you just created. Don’t forget to save your script before closing the IDE. Q) What are the Selenium 1.0 components? There are three variants of Selenium, which can be used in isolation or in combination to create complete automation suite for the web applications. Each one has a specific role in aiding the development of web application test automation. Q) How to export the tests from Selenium IDE to Selenium RC in different languages? 1. Open the test case from Selenium IDE. 2. Select File -> Export Test Case As. Q) How to insert a break point in Selenium IDE? 1. Right click on the command in Selenium IDE and select “Toggle Break Point”. 2. Select the command in Selenium IDE and press “B” key on the keyboard. 3. If you want to clear the break point once again press “B” key on the keyboard. 4. You can set multiple break points in Selenium IDE. Q) How to insert a comment in Selenium IDE? Comments in Selenium IDE can be set in two ways. 1. Right click on the command in Selenium IDE and select “Inert New Comment”. 2. If you want to comment an existing line, we need to follow the below mentioned steps. a. Select the source tab in IDE. b. Select the line which you want to comment. Q) What is Selenium server default port number? Selenium server default port number is 4444. Q) How to run Selenium server, other than the default port 4444? We can run Selenium server on java -jar selenium-server.jar -port. Q) How do you check a single test method in multiple browser? We can check a single test method in multiple browsers by using Selenium Grid. Q) How do you identify an object using selenium? Q) How do you handle Ajax controls using selenium? We can handle Ajax controls by using wait for condition command. Q) What is Selenium WebDriver or Google WebDriver or Selenium 2.0? • A well-designed standard programming interface for web-app testing. • Improved consistency between browsers. • Additional functionality addressing testing problems not well-supported in Selenium 1.0. Q) Explain about Selenium the Open Source Testing Tool for web application? Selenium is a portable software testing framework for web applications. Selenium provides a record/playback tool for authoring tests without learning a test scripting language. Selenium provides a test domain specific language (DSL) to write tests in a number of popular programming languages, including Java, Ruby, Groovy, Python, PHP, and Perl. Test playback is possible in most modern web browsers. Selenium deploys on Windows, Linux, and Macintosh platforms. Selenium was originally developed by Jason Huggins in 2004, who was later joined by other programmers and testers at ThoughtWorks. It is open source software, released under the Apache 2.0 license and can be downloaded and used without charge. The latest side project is Selenium Grid, which provides a hub allowing the running of multiple Selenium tests concurrently on any number of local or remote systems, thus minimizing test execution time. Q) What is the use of context menu in Selenium IDE? Q) Explain about Selenium RC Java client libraries? Q) Explain about Selenium Server? Selenium Server receives Selenium commands from your test program, interprets them, and reports back to your program the results of running those tests. Q) Why use TestNG with Selenium RC? Selenium IDE by itself is great for creating test cases and executing single tests. TestRunner is ok at running a test suite. But if you want full automation against different server and client platforms, you need a way to invoke the tests from a command line process, flexibility in how you create your test suites, and reports that tell you what happened. TestNG provides these features. You can use Selenium RC with other languages as well, but since Sakai is written in Java it makes sense to stick with the language most of us are familiar with already.